Speaker Tip: No Standing Ovation! April 12, 2019 Tonya Hofmann Speaking Tip Videos! 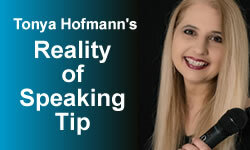 Tonya Hofmann: CEO & Founder of the Public Speakers Association explains why receiving a standing ovation hurts you long term and creates very little momentum in your speaking business.